POSTED: Fri, 08/14/2015 - 16:00 | POSTED BY: Traci C.
Disney has recently launched a new 'Disney Vacations' magazine on Flipboard. The daily magazine will feature stories and news from Walt Disney World Resort, Disneyland Resort, and other Disney vacation destinations. Fans can sign up for Flipboard using Facebook or an email address. Flipboard is described as your own personal magazine where users can follow topics that interest them and share stories, videos, and photos with friends. 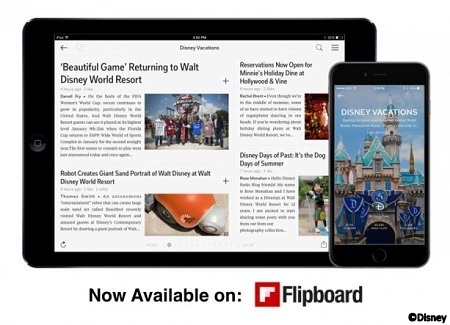 There is a Flipboard app available in the Apple Store and the Google Play store, and it is also available online. The Disney Vacations magazine on Flipboard has recently posted stories about summertime at the hotels at the Disneyland Resort, back-to-school shopping ideas from Downtown Disney, and more. Most of the stories on the Disney Vacations magazine on Flipboard are also found on the Disney Parks Blog. Will you be joining Flipboard to read the Disney Vacations magazine? Leave us a comment and let us know.